So many people want to "write a movie", and perhaps they have a plausible story to tell, actually writing a screenplay used to be a laborious job. There are certain rules one has to follow when writing and formatting a screenplay, as well as submitting it to the right "people". I've written four screenplays (TV movies), taken a short screenwriting course, read books, and even tried the computer program. They are still with me. So, it's all good and well having a story to tell, but it's worth finding out the correct protocol when submitting it. Whether you want to write a feature film or write for television, you've got to know how to write an outline, a synopsis, and a treatment. You've got to know how to do it if you want at least a chance anyone will even notice you (I'm assuming you don't have Hollywood connections!). 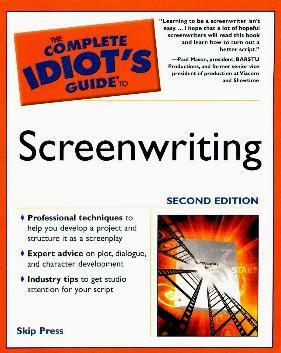 In this book you'll also learn to assess whether or not your particular movie idea is workable in terms of budget, the correct presentation procedure of your script, how to "fix" it, and how to sell it. Author Skip Press (is that his real name?) offers constructive and firsthand advice about an industry so many hopefuls can use and become productive. Vitally important is the way you format your screenplay, how you package it, to whom you send it (a friend of a friend can be the link you need), and then how you take rejection, and, learn to rewrite. It's all here. You know what? I'd bet money on being able to get your screenplay read in Hollywood would be easy if you, (a) were "someone", (b) knew someone, and (c), even if you didn't know how to actually write one. Goes like that. Conclusion - Extremely comprehensive and useful to anyone willing to do the work - the rewards can be wonderful.